Each year, the use of electronic devices, including printers, keep on increasing due to the rapid development of technology. Thus, Epson launched Epson XP-440. This machine has the function of printer, copier, and scanner in just one device. It has Google Cloud Print feature, allowing the users to directly scan to and print from their cloud online services. It is equipped with a 2.7 inch touchscreen as its operational panel to assist the users in navigating the device. 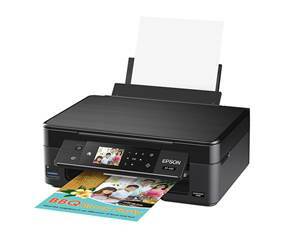 Epson XP-440 only consume 13 watts during operation and 0.3 watts during standby mode, making this printer a very efficient device. It has Epson Micro Piezo, which allow the printer to create ink droplets as detailed as 3 Pl and ensure the quality of the outputs. The speeds of this printer are pretty average, with 10 pages per minute for mono printing and 4.5 pages per minute for color printing. The maximum resolution is pretty decent, with 5760 x 1440 dpi. The design of Epson XP-440 is remarkably compact, with 15.4 x 11.8 x 5.7 inches in width, depth, and height respectively, and 9.48 lbs. in weight. It will not occupy too much spaces in your room. It is compatible with Mac OS X and Windows.